There are so many wonderful things about fall - the chill in the air, apple picking, layering cozy sweaters, sunflowers, warm candles around the house and so on. By far, my favorite season of the year for all of those reasons + more. However, one thing that tops the list is TV. I watch SO many television shows that it's a little embarrassing. So, the reason behind this post and the party setup above is in honor of my favorite show, Scandal, that returns tonight! My best friend introduced me to the show over the summer via Netflix (thank god for netflix!) and I immediately became obsessed. (i.e. binge watching: three seasons in three weeks) If you watch the show, you know how amazing Olivia Pope is. She's so beautiful, successful, smart and wears the BEST clothes + accessories. I mean, can we zoom in on those Prada bags a little more often? 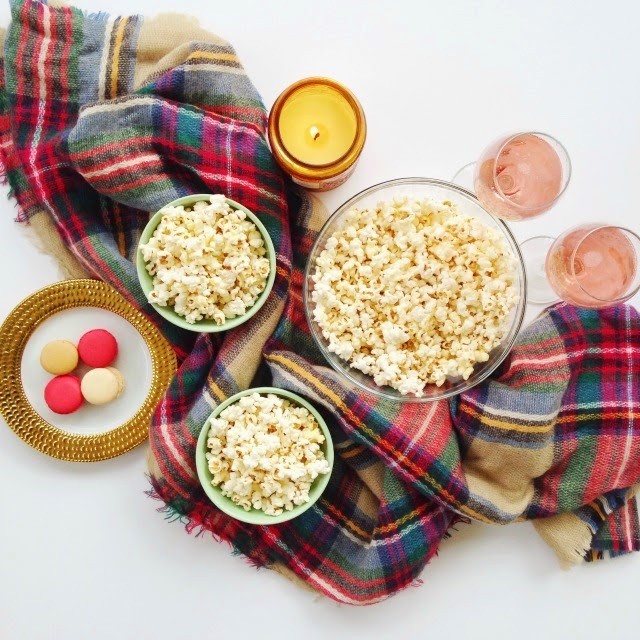 So, today's post is in honor of girls nights everywhere, celebrating fall + TV shows with popcorn + rosé - cheers, lovelies! P.S. - This plaid blanket scarf was such a huge hit last year, but sold out quickly. Luckily, Nasty Gal has an identical one! Get it HERE! My sister loves Scandal and has highly recommended it! I need to watch it! I am a huge Nashville fan!! I am SO excited for Revenge! PS I found that blanket scarf on amazon for such a good price! I have always wanted to watch Scandal, might have to! That first picture just looks so cozy - love that scarf!! Can't wait for Scandal! Also going to check out the new show "How to Get Away With Murder" which is right after it. Scandal is the best! I got hooked on it over Netflix this summer as well! Should be a great premiere! Girl that looks like the perfect night.